I called this a WIN for the Obama administration as well as for the White House. And I still support this mandate. So now the administration may cave to the Bishops? I fail to see how providing womens health services disrespects the faithful. If anything, what I read this morning is disrespectful. Local Cardinal-designate, Edwin OBrien flat out said that the local Archdiocese wont comply, even if they have to drop health insurance for employees. (http://www.wbaltv.com/news/30404284/detail.html) Thats 3500 employees that will be without health insurance. As one of my facebook friends put it: ‘Catholic Church, Way to share the love by threatening to take away health insurance from your employees. Very Christ-like’. It appears that at least this diocese is throwing a tantrum. Rather than provide women with these services, they would rather cut off 3500 people from health care altogether. Ya know, cuz that will certainly help out somehow. Did you know that polls show that 58% of Catholics support the mandate? And if you only count Catholic women, that percentage raises up to 62%. (http://publicreligion.org/research/2012/02/january-tracking-poll-2012/) And depending on the poll you read, the percentage of Catholics who use birth control ranges from anywhere from 77%-95%. It appears that the Catholic church is still trying to control women and what they do with their bodies and their health care. And while this is nothing new, you would think by now that an organization ran by men would learn to back off. It is obvious just by looking at the percentages and speaking with other Catholic women that they are failing miserably in this attempt. Is the church afraid that their Catholic employees will use birth control? Or are they afraid that they already do use it and will just use this mandate to get it thru their employee health plans? If you look at the comments on my prior blog post on this topic, someone (presumably a man by his avatar) posted that 54% of Catholics voted for Obama in 2008, and now they are angry with him for this action. I find this laughable. Yes, laughable. If you are a Catholic and voted for Obama in 08, then you werent exactly voting your conscience to begin with….so why be mad now? He was pro-choice when he was a Senator. Why the sudden disapproval? It seems to me that you got what you asked for. Dont get mad at Obama when you knew all along that his politics didnt agree with yours. Hissy fits seem to be the norm in this argument. There are calls to close Catholic hospitals and other assorted Catholic charities over this. How does this help ANYONE? The best quote Ive seen is this: Eating pork is legal. Does that threaten the religious “rights” of Orthodox Jews? Its not often that I post two posts about intolerance on one day. This one is about religious intolerance….or rather, intolerance against the non-religious. I think we all would agree that the banner is, in fact, highly Christian in nature. However, this young lady is a non-believer and thought that displaying this banner in a prominent place in her school auditorium was in-the-least excluding those who werent of like mind. So, she decided to do something about it. She created a facebook page to rally support for her cause. And so it began…..a year and a half of threats and insults. 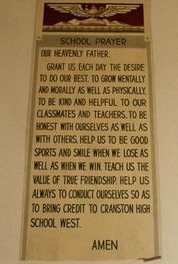 There were heated meetings of the school board and then the ACLU picked up the case against the Cranston School District. After the courts decision, Mayor Chafee put in his two cents and surprisingly agreed with the courts decision. In what world do threats of violence and hateful attacks fit in with those words? The courts decision led to online threats, not only from strangers, but from those in her own community and school. Lets get real now people. I dont personally care what you believe in, or dont believe in. Thats not my business. But when a court says that you need to remove something religious from a public building because it violates the Constitution, you probably should do it. Quote: I contemplate with sovereign reverence that act of the whole American people which declared that their legislature should ‘make no law respecting an establishment of religion, or prohibiting the free exercise thereof,’ thus building a wall of separation between Church & State.” Jefferson reflected his frequent speaking theme that the government is not to interfere with religion. Let me wrap this post up with where it currently stands. The police and school officials are now investigating threats of violence against this student. Apparently someone posted her home address, and there are horrible threats (as seen in above links) against her personal safety. Personally, I dont care if I agree or disagree with someone, I will NEVER threaten someone with violence. And those who call themselves Christians making these threats against this teenager (especially those who are adults) should be ashamed. 30 Days of Truth – Day 19-What do you think of religion? OR what do you think of politics? Comments Off on 30 Days of Truth – Day 19-What do you think of religion? OR what do you think of politics? What do you think of religion? Or what do you think of politics? I took a break yesterday from this series in order to address something else here on my blog. And in doing so, Im one day behind on this series, but Im choosing not to skip any days even if I miss posting here and there. Im sort of glad that I did because there is something I want to address in todays topic, that some of you may ‘take the wrong way’ – Some of you may even make assumptions based on what this post is addressing. And some of you may not even identify with what Im posting about because you have been ‘brainwashed’ into this type of thinking. Im going to post something that I know that you wont like…. What do I think about religion? Where does one even begin? To some religion is exhilarating, uplifting, wonderful. To others it can be judgemental or tiresome. Its one of those things where not everyone will agree. Even those with similar beliefs will not agree on alot of things. I was raised in a Christian church. I went to Sunday School. I even went to a summer Bible camp. I was raised to think Christians were full of love and stuff like that. I was raised to think that Christians werent supposed to judge other people. Everyday I see more and more that *most* Christians do not practice what they preach. It upsets me that among the various types of friends I have, some of the nicest people get treated like crap just because they dont believe what someone else believes. So many of my friends do happen to be varying denominations of Christians (ie Catholics, Baptists, Methodists etc) And they all claim to be this all-loving type of person…. Ill just start this rant off with something I think EVERYONE will agree about……and I only have to say 3 words and you will know EXACTLY where Im going with this. WESTBORO BAPTIST CHURCH. Its sorta crazy that so many Christians will call these people insane, crazy etc, when they are just as guilty of doing similar things. They just dont picket funerals….They just dont hold up hatefilled signs….They ‘hide’ their crazy. And the crazy gets worse when it comes to how Christians treat and talk to those who dont believe. You see, last week columnist, author, speaker and atheist Christopher Hitchens passed away after a battle with cancer. Most people I know have never read anything hes written because Christians are instructed to not read, listen etc to anything an atheist would say. But yet, the minute Hitch died, I saw a thousands of people posting about how he deserved to die, that his lack of faith killed him, and the best reactions came from a hashtag #godisnotgreat (which is the title to one of his books) Many, many, many posts from Christians claimed that whoever made up this hashtag should die. Youre more than happy to read the ‘best of’ reactions posted here: http://www.buzzfeed.com/mjs538/25-dumbest-reactions-to-godisnotgreat Some of you MAY be appalled at this. But some may actually agree with these people. To those who agree with what those posts say, I dont want to hear your excuses. You are sick. Because I have friends who are atheists, and yes, I do call them my friends…..I see alot of discussion about this hypocrisy. However, upon further review, and after MUCH discussion, I have begun to realize that hate is what you get when it comes to being someone of a different faith or if someone has no faith at all. In fact, if you have no faith, you are shunned by those with faith. And, just to change it up a little…..Im sure by now youve heard about this Tim Tebow guy. Hes a quarterback in the NFL. One of those ‘in your face’ religious types. And while hes got every right to do and say whatever he wants….even believers are a little sick of it. There are running jokes all over the internet about if his team loses, that god must not love him anymore, and SNL even had a skit with jesus telling him to back off a bit….but Bill Maher tweeted his own take and has been ripped to shreds. Wow, Jesus just fucked #TimTebow bad! And on Xmas Eve! Somewhere in hell Satan is tebowing, saying to Hitler "Hey, Buffalo's killing them"
I guess because most national media outlets dont watch Bill Maher, they let this just slip on by….No national media story went out about this, unlike some random tweet posted Christmas Eve. And Im quite shocked that my republican friends, who are STILL up in arms about the Bill Mayer tweet, have nothing to say about the above linked youtube video. Because even tho it starts out as an ‘attack’ on Tebow, it literally shreds apart some of those running for the gop nomination for president. Im not saying you gotta agree with Bill Maher. I disagree with some of what hes said. But lets stop acting like you are better than him. The reason I chose these examples, is that when you post certain things online, like on twitter, on on your own blog, you will get responses from people you dont know and dont follow. And its crazy sometimes what you get replied on. Its crazy the assumptions people make about you after seeing ONE random tweet in a hashtag search. And they DO judge you based on that one tweet. Ive been called everything. Some names I wouldnt call my worst enemy. Many assume Im some liberal nut job. Many assume that Im some redneck. Many assume things about my beliefs. And while looking thru some of the replies Ive received, I click on their profiles to see what? They are Christians. Some are even leaders of various churches, youth groups, etc. Im sure that many people (and even those who do know me) will make some sort of assumption based on this blog post. You arent going to ‘win someone over’ by calling someone names and telling them you wish they were dead, etc. Havent your ever heard that you win more people over with honey? Is your denomination more important than your family? The basic question asked was: Should I attend my daughter and her familys baptism into a non-denominational congregation since Im Catholic? I am absolutely flabbergasted that ANY parent would be against their children and grandchildren being received into another Christ-believing church. Just what exactly are you prooving by not going? I know! Youre prooving how inconsiderate and uncaring you are as a parent! Lets just read your excuses for not being there for your family…..just because you are Catholic and they choose not to be ~ and then sum it all up by saying this is ‘heartbreaking’ ~ Get a grip on the definition of the word! A heartbreak would be a disease that has no cure; a heartbreak would be one of your family members being involved in a horrible accident; a heartbreak would be that your children/grandchildren would have no interest in religion – period! So lets re-evaluate what you are really saying lady! My interpretation on your letter to the priest is that you want your family to think in the same manner as you, but you have lost that power. Your children are adults with families of their own, and they have chosen a slightly different path. Deal with it! Instead of insisting that its your way or the highway, why dont you BE THERE FOR THEM! If you are so sure about what your faith (denomination) is, what is the harm in seeing your family be received into this other church? You MAY just find out that this church beleives in the same basic principles that you do. And……Im not just irked at this letter! The response from the priest is just as perplexing! Basically, he tells this mother that decisions like this are anguishing. Excuse me? Anguishing? Then, he says there is no ‘right or wrong’ way to deal with this situation and that you shouldnt have to compromise your convictions…..uh….what? After going on for several paragraphs, the priest then gives a further impression that its not a reflection of the parents upbringing that her children have choosen this path……. This makes me incredibly incensed! How is it that you see this situation as such? Im sorry, but how is being raised in a denomination that believes in Jesus, and then going into another denomination that beleives in Jesus, so wrong? I really want to know how this is apparently some horrible path that they could be going down? I dont know these people, but I am assuming that they arent drunkards, drug abusers, party animals, murderers, etc. Wouldnt THOSE things be the wrong path? Isnt it good that your family has choosen something resembling Christianity? Some people really need to put their priorities in order! You cant support freedom only when it suits you! A mosque is to be built near Ground Zero in Manhatten….and wouldnt ya know it? Theres controversy. Aside from some of the snarky comments Ive read, most of the reactions are just downright rude and disrespectful. * Ya know, if they would have rebuilt those towers (in defiance to the terrorists or whether to keep the economy going) we wouldnt be having ANY issues with any type of building in Manhatten. * You cannot lean on our Constitution only when it agrees with what YOU agree with! If it says ‘freedom of religion’ thats what it means. Not everyone in our country has the same religion, nor can many of the same denomination agree on social issues…..so get off our so-called high horse! No matter who or what you choose to worship…..or in some of you, choose NOT to worship, isnt this America – where we are ALL supposed to be free? No matter if youre still waiting for your messiah, waiting for Jesus’ return, or waiting for nothing……we all should be able to do so freely without fear of persecution…..does this sound familiar? Nowhere have I seen it written, that freedom of religion only pertains to those you agree with. A bonfire of Quarans on 9/11? It amazes me that the first impression I have of this pastor is his statement that he would burn the Quaran because he doesnt believe that its sacred. In the same minute, the pastor states they have nothing against Muslims and that they are free to worship….but honestly….does he think that even makes sense? How can you burn what that faith beleives to be their sacred text and then in the same breath claim to welcome them? I think Rick Sanchez says it best….Why counter hate with hate? In discussing this upcoming event with some of my friends, I have not heard one opinion on the side of this pastor. Not ONE! What does that say to you? Ive only talked to a few self-described skeptics/atheists and even they are perplexed about why someone would do this. While I am generalizing their comments, the gist is that this will only lead to more issues between Christians and Muslims. And I have to say, that I agree. It amazes me how many Christians cant see how some of the more radical faiths could hate us so much. But, in the same breath, they spew off all this vile basically stating how much they hate those people. How is their hate different from that?